First show in a while, should be fun! 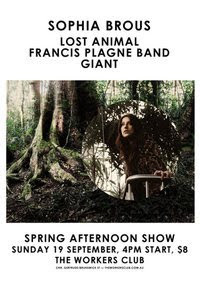 Six piece Francis Plagne band, Sophia Brous Band, Lost Animal and Giant. 4PM, Sunday the 19th of September, at the Workers Club, corner of Brunswick and Gertrude streets, Fitzroy. Eight dollars.